This school year I am adding 6th Grade Social Studies to the list of subjects I get to teach. My plan was to have a simple bulletin board and place a few postcards around a map to help teach mapping skills. Thanks to an amazing PLN and friends my simple bulletin board and lesson has grown. Before school has even started I have received several post cards which sparked ideas on how I can make connections with these postcards not only to mapping skills but to people, culture, and world history. My simple bulletin board is now a wall with 3 different map types. Since I am also a very techie person I now have an interactive map thanks to ZeeMaps that I posted to my classroom website. As we receive postcards from around the world I will pin the places on both the Where in the World Wall and interactive map. I even added a QR Code to the wall as a short cut to the interactive map. Click here to view my interactive map. 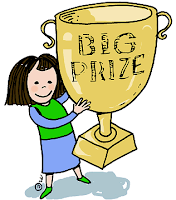 Please login to the Teachers Notebook to claim your prize. 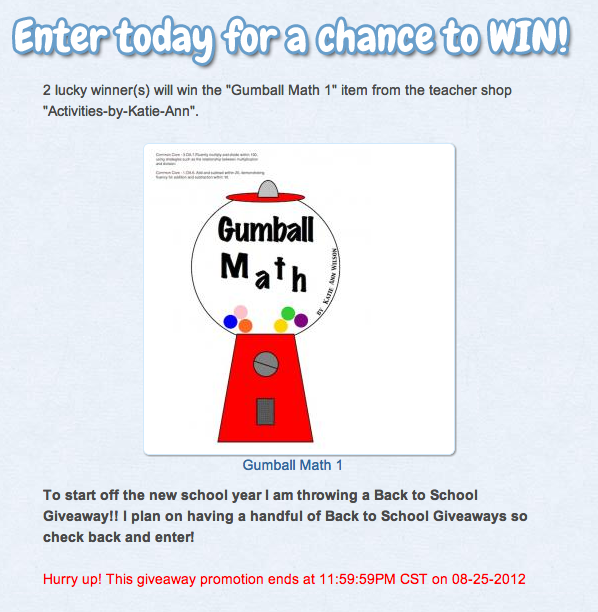 Here is the next Back to School Giveaway. To enter you will need to visit the Teachers Notebook. 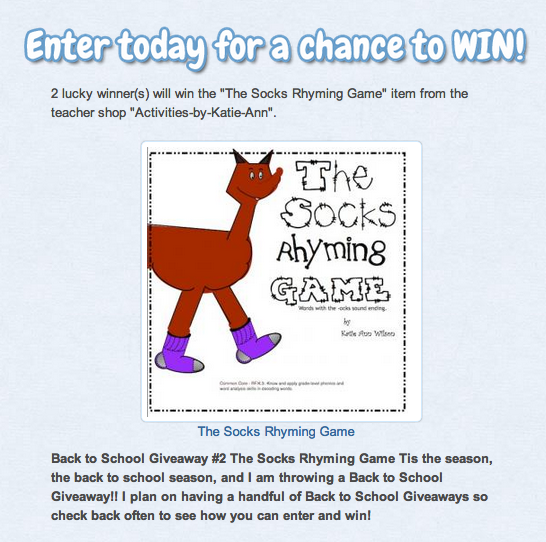 There will be 2 lucky winners of the Socks Rhyming SMART Board Game. When I go shopping for my everyday items I try to pick the items that have a Box Top on them. After learning about eBox Tops I thought I would try to shop online and earn Box Tops that away. Let me tell you how easy it is to shop online and earn eBox Tops, and guess what there is no cutting out those little squares, or forgetting to in my case. 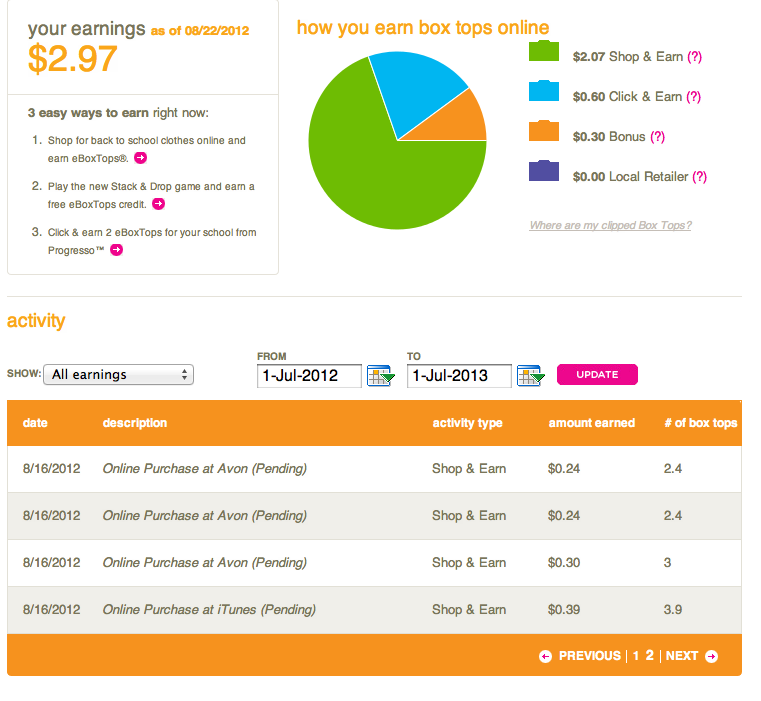 After I had created my online account for eBox Tops I went to their Market Place. They have tons of online partners so I picked out two of them and gave it a whirl. My 1st purchase through the Market Place was with iTunes. I purchased an ebook that cost me $12 and in return I earned 3.9 box tops or $0.39 for my school. My next purchase through the Market Place was with Avon. I purchased some needed items and ended up earning 15 box tops or $1.50 for my school. So far I have earned for my school $2.97 and I didn't have to clip one box top out, how cool is that. Make sure you are logged in to your Box Top account and shop through the Market Place. Tis the season, the back to school season, and I am throwing a Back to School Giveaway!! I plan on having a handful of Back to School Giveaways so check back often to see how you can enter and win! Bonus: I align all of my activities to Common Core Standards. To enter the Back to School Giveaway #1 Gumball Math simple visit the Teachers Notebook store and enter. The drawing will be 08-26-2012 and there will be 2 lucky winners. As the beginning of a new school draws near the campaign for Box Tops 4 Education gets under way. You can find bonus Box Tops on many of your favorite back to school items as well as food. I don't know about you but I try to remember to cut out the Box Top, but sometimes I just forget. It seems that each year the program becomes stronger. I was web surfing and by accident I came across their website. Did you know you can earn Box Top points digitally? You can even keep track on your school's progress and see how much money your school has earned. Before I start promoting eBox Tops I had to try it out. In 2 minutes I earned for Liberty Middle school $0.60 digitally and all I did was look at one of their recipes. I also learned that the program has teamed up with several other companies such as Target, Kmart, Walmart, Kohls, iTunes, and many more to offer eBox Tops. Found your school and select it. You can also earn digital Box Tops by going to Click & Earn. Look for Box Tops and cut the out. Bundle your Box tops in groups of 10. Don't forget to turn them in before their expiration date. Look for Bouns Box Tops. 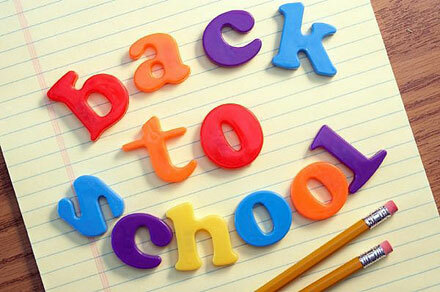 Since its the season, back to school season that is. I am having a Back to School Sale. Everything is on SALE. Save 20% on some really fun SMART Board activities. I've tried to connect all activities to the Common Core Standards. Visit my TPT store or my TeachersNotebook store to get in on the savings. I am also taking requests. If there is a topic, activity, or a lesson you would like to see in my store just let me know. Also keep an eye out I will be having another Giveaway very soon a Back to School Giveaway! 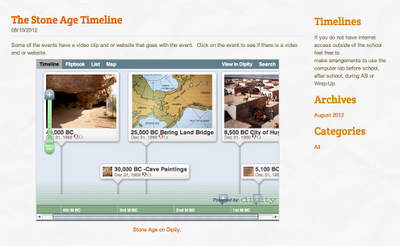 Since I am going to start teaching 6th grade Social Studies I wanted to have a few interactive timelines. I attended this webinar that introduced me to Dipity. 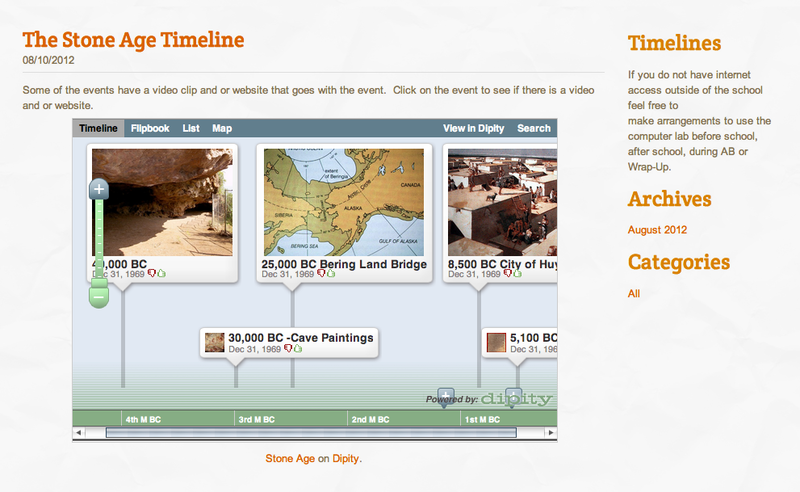 Dipity's site makes it simple and easy to make interactive timelines about any subject or topic. The main reason I picked this tool was that you can add a picture, a video, links, and other information to an event. I did notice that there are a few bugs in the system. For example I wanted to make a time line over the Stone Age and the system kept reseting my dates to 1969. I just made sure I put the date I wanted in the title and had everything in the right order. I also notice that Dipity didn't really like Google Chrome so you may want to use FireFox. Before you have your students create a timeline you should play around with it 1st. When setting up your timeline make sure you enter the focus date. Enter the date in the title. As I prepare for the new school I decided that my classroom website needed a make-over. My goal is to make a website that is both informational and interactive. I want my website to be the 1st place my students to go to for their assignments, discussion topics, resources, and important information. I want my classroom website to be an extension of my classroom. 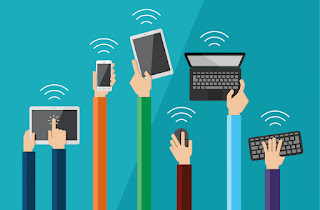 I've attended several webinars and looked at several other teacher's websites to help me get some ideas of how to approach rebuilding my site. There are several places you can go to in order to get a free website for example; Google Sites, Weebly, Webs, and Wix to name a few. I used Google Sites for my 1st classroom website. It worked ok, but I needed a change. For my rebuild I wanted something more dynamic, a site that would grap my student's attention. I decided to use Weebly because they had an educational side and plus it was free. Weebly was very easy to use. All you have to do is drag and drop the elements where you want them. You can even copy and paste your text if you already have it typed up. To make my site more dynamic I added my Google Calendar, a slideshow, a Voki, and an Interactive Worksheet. I also added buttons to the sites that we will be using the most. Keep in mind as you look around on my site that I am still building and tweaking it. I have been surfing Pinterest for DIY ideas I can use in my classroom. Teachers do a great job sharing their ideas. I discovered tons of inventive, creative, amazing, and genius ideas I can't wait to try in my classroom. I can't wait to use this in my classroom. Buy $1 tins to hold pencils. Label one tin "Needs Sharping" and the other "Sharped". Buy $1 tin and label "Please Return Me" and place pencils in it. Find a straw dispenser and turn it into a pencil dispenser. Recycle frosting containers. Color each one a different color and place that color of colored pencil in the container. Find a Gumball Machine - I bought a Junior Carousel Gumball Machine Bank 12" from Amazon. Fill it with eraser toppers - I found 25 for $0.88 all different colors. Please feel free to follow my Classroom Ideas Board in Pinterest. Want to help our kids? It’s easy. Our school can receive up to $10,000 in Target GiftCards® for books or any supplies we need. Wouldn’t that be great? All we need to do is vote for our school each week until September 8. It’s part of Give With Target®. 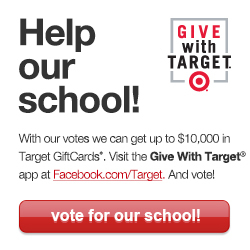 For every 25 votes our school receives, Target will send a $25 gift card. Find out more and vote at Facebook.com/Target. Click Here to Vote for Liberty Middle School.